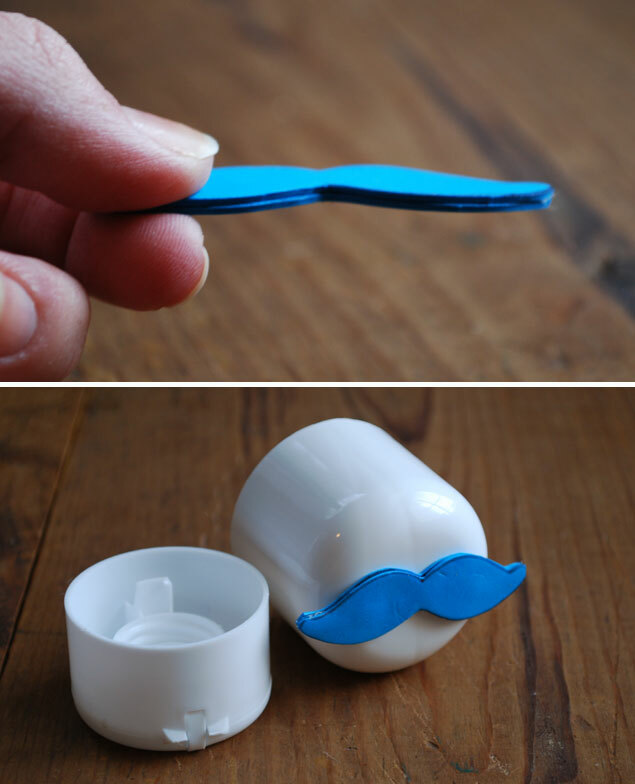 Like I’ve mentioned in past projects, when it comes to diy… I’m a big fan of cute projects that anyone can do. 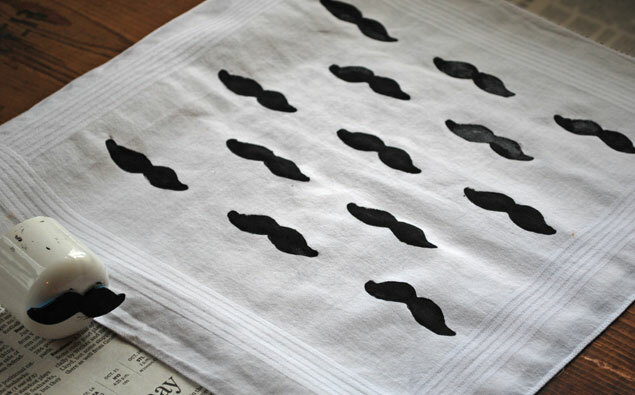 This DIY Stamped Handkerchief tutorial is easy enough for crafters at any level… even beginners! In honor of Movember, and because we love the men in our lives, we thought a mustache project would be appropriate this week. If you know any Mo Bros, be sure to support them and help spread awareness or head over here for info on contributing! 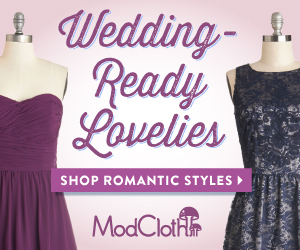 Wouldn’t these be just perfect to wrap up as fun, handmade gifts for your groomsmen? 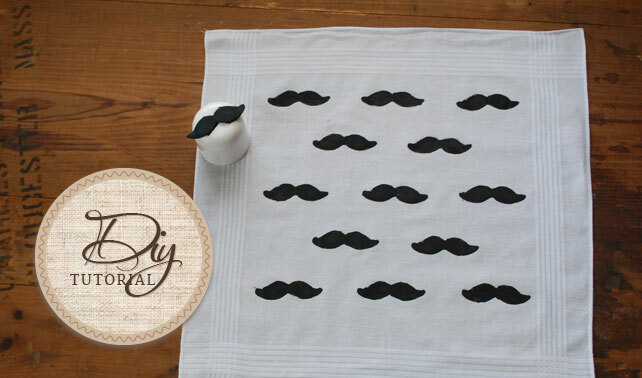 An ideal gift to fit right in with the mustache trend! 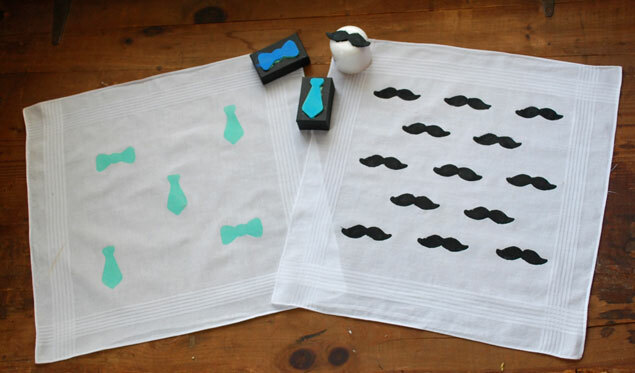 Step One: Handkerchiefs – Purchase a package of plain white handkerchiefs. Packages can be found at department stores or online at reasonable prices – they’ll typically be under $2.00 per handkerchief. 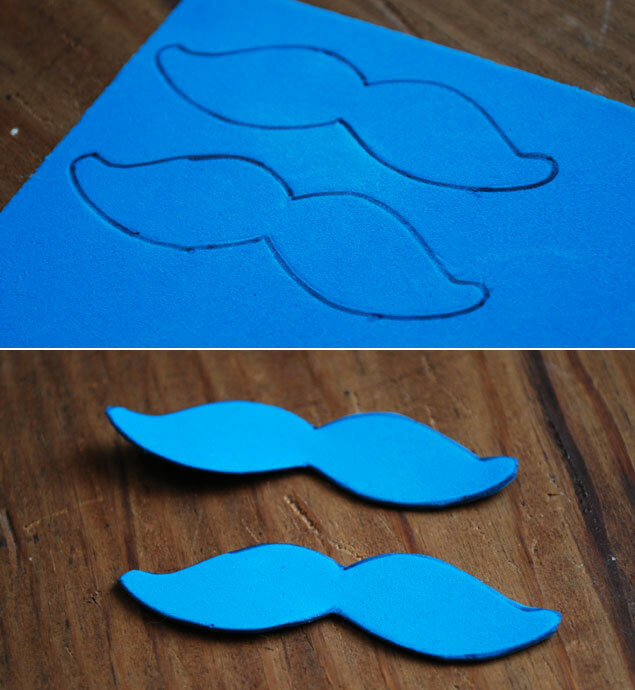 Step Two: Foam Shapes – Draw your mustache shape on a sheet of the craft foam. The foam I used is very thin so I doubled up to make the stamp a little thicker. Of couse, you can also create stamps in any other shapes. Letter stamps would be a great way to personalize your groomsmen gift with their initials! Cut out the shapes. Step Three: Glue – Using hot glue, hold the two pieces together until set to give the stamp a solid support. Next, you get to upcycle a household item for your stamp handle! Hot glue your foam stamp onto the base of your handle. I used the cap to a bottle of lotion (see the image below). Empty spice jars, wine corks or bottle caps also make good stamp bases. Choose an item relative to your stamp size. You’ll see for my second design with the tie stamps, I used the top lid and bottom of a small jewelry box for other stamp handles. Basically, anything that you can hold onto to firmly press your stamp will do just fine. 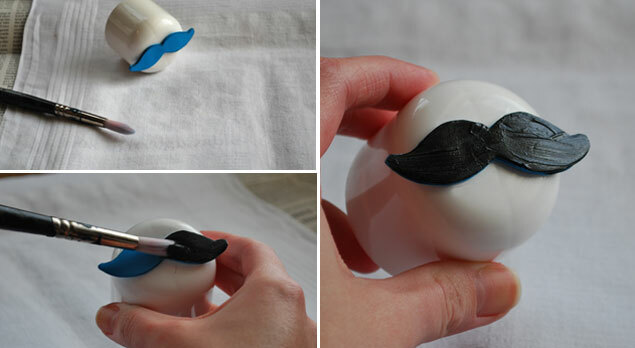 Step Four:Paint and Stamp – Paint your foam stamp. You can also dip the stamp in the paint. However, I find that it is easier to control coverage and amount of paint if you brush it on. Now, stamp your design onto the fabric! 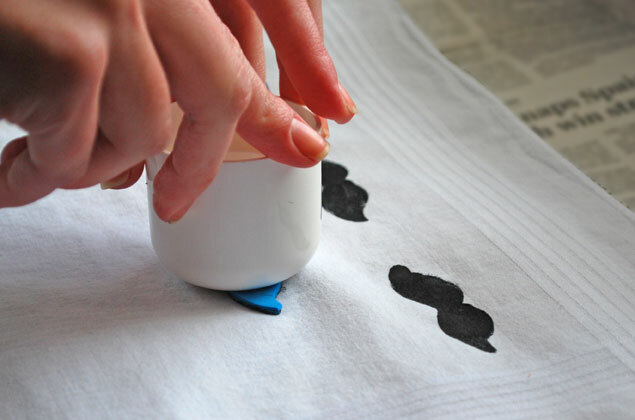 Step Five: Heat Set – When you’re finished, you’ll need to set the paint which will allow the handkerchiefs to be washed without ruining your stamped design. Let the paint dry completely. Then, simply set your iron to dry (no steam) and iron the back side of your handkerchief for five minutes. Keep the iron in motion. Do not press in one place. All that’s left to do is wrap up your hand stamped handkerchiefs and give them to your groomsmen!